We left Orlando a bit late, at 10:30. My planned departure was for 9am but we never make that. It takes us a few days to get back into the swing of road tripping. The weather was unseasonably cool and overcast. We drove straight through to Mobile Alabama, where we stayed at a Comfort Suites, which is always a reliable place for us. We made good time and nary a law enforcement officer to be seen; always nice to put the peddle to the metal! No incidents and smooth sailing all the way. Light traffic as it was a Sunday. We got up early and got away at about 09:30 this morning. Getting better! Traffic was a bear most of the way. Trucks, trucks everywhere and where did these idiot people learn to drive. The ‘fast lane’ seems to be the right lane where no one drives. Amazing how idiotic people drive and it’s not just in Florida. All the way to Houston idiots sat in that left lane poking along; forcing me and others to try to zoom around on the right; a dangerous thing but what can you do? Trucks, semi tractors were everywhere. Then they try to ‘pass’ each other by accelerating all of TWO (2) mph over the other guy and takes forever; meanwhile traffic backing up behind them. Yes, I understand that technically, you aren’t supposed to go over the speed limit when passing but what idiot politician/bureaucrat came up with THAT idea is beyond me. That was all bad enough, but then we hit Houston at about 4pm; hoping to avoid the traffic I remember from 35 years ago when I lived there. No joy. Bumper to bumper crawl from the Eastern outskirts all the way; took almost 1.5 hours just to get across the I10 to the West Loop South and the Galleria where we had booked a Candlewood Suites room. Our favorite hotel chain; it has a full-size refrigerator and cook-top with all the accouterments you need. We got in at about 6pm and I had plans to have dinner with my ‘Cousin’ who I hadn’t seen in about 40 years! Finally made it to Sweet Tomatoes on I10 West at about 7pm. They were gems about driving in all the way from the Woodlands, way North of Houston just to visit. We closed the place and the nice folks at Sweet Tomatoes wanted to go home so asked us to leave. Lovely evening and we could have talked all night but Tom had a flight to catch to their place in Denver Tuesday AM. Oh, I almost forgot to mention, if you ever stay at the Candlewood Suites at the Galeria, well it’s not quite there, It is a real BEAR to find and GPS is not great. This place is Inside the 610 loop almost tucked in under the Southwest Freeway and 610 South. Nice place once you get there and they have a night guard to patrol the parking lot all night. We slept in a bit and finally broke out the laptops and connected to the free WiFi. I’m trying to keep/maintain this log/diary of this trip as we go. Tonight, I am seeing an old friend I haven't seen but once in about 45 years. Be great to see and visit with Tim and his lovely wife Cindy. A couple of lifetimes ago we worked together; good times. We got off about 10am for a shortish drive to San Antonio. Getting out of Houston was a bear but once on open Interstate 10, not too bad until we got closer to San Antonio then we had some construction traffic. Comfort Inn Suites was tucked back by the freeways but within walking distance to the Alamo and River Walk. We walked up into town and along the river walk for a while then over to the Alamo. If you only have watched the movies, it is Really Smaller than what you would think. It is in great shape with lots of folks taking great care of the place. Armed Texas Rangers are scattered around the grounds for both show and security. We took the River Walk Boat tour which was about 40 minutes with a nice, often funny, commentary. We then headed back to the hotel to unload the car; we couldn’t check in before; too early. After unloading we were tired and decided to Uber over to Senior Veggie at 620 South Presa. Back off the beaten track it was only about a 10 minute drive and we had a really great driver. First time we ever tried Uber; great stuff. Well, Senior Veggie is beyond fantastic. Not fancy at all but the FOOD, OMG It was really out of this world. We ordered appetizers but WOW, they were full meals and more. Very reasonably priced for the size of the dishes and the quality and flavor make it well worth the modest price. We could not eat the full entrees we ordered so took them to go. Stuffed to the gills, we called another Uber which arrived in just a minute or two and got back to our hotel. We visited Senior Veggie for Dinner after walking San Antonio, along the River Walk and visiting The Alamo. What a divine place to eat. The food portions were huge and our appetizers were FULL MEALS so we had plenty to take with us. If you live or visit in San Antonio, whether plant based, vegan or not, the meals are DELICIOUS. We visited St. Joseph’s Church on the way to The Alamo. What a beautiful place and such history. They continue the tradition of saying Mass in German one Sunday each month. If you visit San Antonio this is a must visit; while there, make a donation in the ‘Poor Box’ to help the less fortunate!! Well, the drive on I10 from San Antonio to Alpine was long and mostly boring. The land is dry, so very dry and seems in need of rain. We saw a Fire Truck putting out a roadside brush fire; no doubt some idiot tossed a death stick out the window. That is about the only way these roadside fires can get started. By the time we got to Alpine the temperature had climbed to 98 degrees! HOT and DRY. Like any desert climate, it can change dramatically. We are lucky, SO LUCKY that tomorrow when we explore Big Bend National Park it is going to be 65 in the morning and climbing to low 80’s and SUNNY so just about PERFECT. We are staying in a lovely Quality Inn in Alpine about 80 miles from Big Bend but since the wonderful State of Texas is wise, the speed limits are 80MPH. You can MOVE and get to where you are going pretty quickly. According to the International Boundary and Water Commission, this continental border follows the middle of the Rio Grande—according to the 1848 Treaty of Guadalupe Hidalgo between the two nations, "along the deepest channel". Now in Big Bend today, I pretty much was in the middle and maybe actually IN Mexico by this definition. The Center of the River’s flow was very low and at this point about 6 feet across. I was in the middle of the main channel that was just mud so was I in Mexico? Hmmmm, if I was, am I an illegal as I crossed over back and forth a few times. DO I get illegal benefits? Where do I apply? The drive to Big Bend National Park today was long but the weather perfect. It started out cool but soon was bumping 95 degrees. The road was winding and the speed was posted at 45 in the Park. The terrain is just bone dry, dry and dry! Only about 12 inches of rain a year and I’m not sure how anything can survive there. Still the rugged beauty is breathtaking. It was a long drive today but we wanted to get to Tucson for an overnight before driving to Sedona. We stayed at Comfort Suites at Sabino Canyon to be close to Saguaro National Park-East. We checked Happy Cow for a place to eat and low and behold there was Renee’s Organic Oven at 7065 E Tanque Verde Rd, just a short walk from our hotel. We had a marvelous vegan pizza with homemade crust and all organic toppings. Instead of a tomato base they used a black bean sauce that was superb. Just outside of Tucson, this wonder of a National Park is on the small side and offers a shortish drive through a world of wonderful Saguaro and other cacti plant species. Plenty of great vistas and turn off points to take pictures and it seems a trail biker paradise. They were everywhere! After our lovely drive in Saguaro National Park, we had plenty of time for a nice drive to Sedona. We arrived at our Bell Rock Hotel, which is part of Diamond Resorts but not a time-share. The rates were reasonable for a nice room with kitchenette and full size refrigerator (essential for Road Trip Plant Based Folks). Check in was fine and they had a concierge desk that was very helpful. They offered us a ‘deal’ for two first class tickets on the Verde Canyon Railroad scenic adventure tour. (A $200.00 value). We just had to sit through a ‘sales pitch’ for their time share deals. Well I once did a consulting gig for Marriott Resorts and understand how there cash machines work so we had NO intention of doing anything but heck, $100 each for sitting through a sales pitch is time well spent. Our room was lovely but on the second floor. We travel HEAVY with food, cooler and a plethora of stuff from induction cook-top, pots and pans etc. Then there is the big case we have our hiking equipment, shoes, backpacks etc., lots of stuff. We managed to grab a nice employee and he offered to help; what a blessing. We do carry a collapsible luggage dolly with us and that helps with our electric cooler. We managed to lug it all up, most anyway, and settled in for the evening. We slept in and organized everything for the weeks stay. We headed out early so we could check out the area. We got to the Diamond time share ‘presentation’ was really a one-on-one intensive sales pitch from a lovely young lady. Turns out she wants to move towards a Plant Based Lifestyle so we mostly talked about diet, health, wellness and what we do! She introduced us to her supervisor who suffers from celiac or thinks he does. We gave him our pitch as well. We finally got around to the ‘sales pitch’ and went to see some of the resort rooms; lovely! We gave our hostess two ‘Kitchen & Love’ Quinoa Quick meal cups (with artichoke and roasted peppers) and she was impressed that we can carry these with us (no refrigeration needed). Anyway, we finally got our passes to the Verde Canyon Railroad and left. We went to ChocolaTree Organic Eatery & Marketplace for a latish lunch. This is a ‘raw vegan’ establishment and the ONLY vegan restaurant in town. Hell, we could make a fortune here if we had the backing to open a true full vegan, Whole Food Plant Based restaurant. Anyway, we both had the ‘raw’ enchiladas and they were divine. Not your regular fare as ‘raw food’ can only be heated to 117 degrees but delicious! We followed with Nancy’s raw chocolate cake and my lemon pie with nut crust; again delicious! Unfortunately, not cheap either. WE really could make a fortune here if anyone wants to back us; we would only manage not actually cook. We got up early and grabbed our back packs and headed to the Bell Rock Trail Head. It is a beautiful sunny day and about 60 degrees; perfect hiking weather. We took a more difficult route up from the parking area to Bell Rock, following a dry wash and doing a bit of rock scrambling and climbing but our trusty walking sticks (with camera mounts) we have had for years proved worthy again and we made the trek around Bell Rock and got some terrific pictures. Up early again today and headed to Cathedral Rock. It is hard to believe but this 3.5-hour hike around Cathedral Rock might have been even more impressive than Bell Rock; it’s close. This trail around the Cathedral Rock vistas change at every turn. A relatively easy hike, there are twists and turns and a few steep climbs but pretty modest. The views around every turn are different and the vistas magnificent. The weather was perfect, cloudless skies and a nice breeze at about 70 degrees. We received two ‘first class’ tickets for a ride on the Verde Canyon Railroad after sitting through that ‘time share’ hard sell presentation. Since I once did a lot of consulting for Marriott Resorts, I knew the scam well but enjoyed turning the tables and discussing Plant Based Nutrition. It put the sales team a bit off their game <smile>. Anyway, it was about a $200 freebie so time well spent. We drove to Clarkdale AZ where the train is based. Not a long drive from Sedona and it was, once again, a beautiful day. We arrived a bit early. You just cannot trust the GPS signal in these hills, as it must be the ‘vortex’ influence. It’s a nice train station and has a nice gift shop. Also an interesting little museum to pass the time until the ‘all aboard’ signal. We were in the last car in front of the caboose and observation car. It was called The Phoenix; Nancy was thrilled as the Phoenix is one of her ‘signs’ from her ‘reading’ we received. The cars are a bit dated but in decent shape with comfortable lounge type chairs and some couches with tables. They served champagne and NA Cider (for those of us non-drinkers) which was nice. Chips were set out and a decent relish tray and fruit tray as well as ‘meat sandwiches’ for the carnivores. The train left right on time; it can only go 15 mph on the old tracks but makes for a pleasant ride. The car was frigid and cool/windy in the open-air observation car just behind us and in front of the caboose (which was hosting a ‘private party’). It was actually warmer/nicer in the sun on the observation car deck. educator. Inside the car and outside there was a running audio of the trip, what we were observing and where along the mile-marker route we were. Nice but the personal observations outside were more vivid and animated! It was a four (4) hour ride and was well worth the time spent. If you have a free day near Sedona and $200 you may want to try it out. We got an early start for our drive up to Moab. We had loaded a lot of the ‘stuff’ into the car last night so only had to get the cooler and food stuff in the back with cool packs. Much of the cooler contained non-dairy yogurt and other items that we thought would be in short supply in Moab. There was no Natural Grocers there (bummer). It was a coolish morning when we left Sedona for the road to Flagstaff Arizona. The weather was clear as we said goodbye to the Red Rocks and the Sedona Vortex. Nancy discovered that Moab, in Canyonlands National Park, was a ‘sister vortex’ to the ones we hiked in Sedona (Bell Rock and Cathedral Rock). Anyway we left Wupatki after a short hike down to the ruins and a few pictures; it was just too cold/windy to stick around much longer. We had been to this part of the Country before so again diverted on a sort jog over to the Navajo National Monument where we had been in 2015. Again, another stamp in my book! I had a sticker. The bad news was that when we checked in at the National Park desk (non-fee parks don’t require this but it is a courtesy to show your Park Pass, I discovered I had lost my Lifetime Senior Pass (an invaluable asset to Senior Travelers). The current fee was $80 for a replacement but we called and left a message at Wupatki in hopes of it being turned in. So onward we drove towards Moab. Our route took us through some previously traversed roads but they were all new once again. We again diverted a bit to drive through Monument Valley (famous for many John Wayne films of the ‘Old West’). The snow flurries stopped and the weather began to clear as we entered the Valley. I credited Nancy’s amazing ‘Vortex Energy’ for clearing the sky's!! The drive, over well-maintained roads, was amazing. We stopped at a roadside Navajo Indian station and Nancy bought a beautiful silver & turquoise book mark (quite large). Lots of pictures that will be posted on our travel website (http://roadtrip.skipstein.com/) after we get back to the office. Because of my diversions, it was running later than what we like to arrive at a new location but we made good time into Moab. We checked in to River Canyon Lodge, where we had stayed back in 2015. A great location and easy walking distance to all the shops and restaurants in Moab. The rooms are not large but have a microwave and decent mini-refrigerator with smallish freezer (good for re-freezing ice packs). We unloaded, once again, and got settled into our room on the third floor (thank goodness for elevators as we do travel heavy). We decided to ‘chill’ today after the long drive and strenuous hiking in Sedona. Moab is a great ‘walking city’ with lovely shops staffed with helpful and friendly folks. The Moab Brewery is HIGH on my list to visit as they have the BEST Root Beer I have ever tasted. Only brewed and on-tap locally you just have to visit Moab to enjoy it. It is a full-service restaurant and bar as well and I’m told the beer is beyond good; but as a ‘tea teetotaler’ I no longer partake of the spirits. We were THRILLED to find the Moonflower Coop just a short walk from our hotel. We had visited back in 2015 but it was just a tiny place with limited fare. Now it is Amazingly well stocked with a small restaurant and a wondrous menu of ‘take out’ or ‘eat in’ sandwiches, wraps and full microwaveable meal packs. We rejoiced at this find as they carried a full line of amazing Plant Based foods and items to try. I found an amazing cashew yogurt (Cashewgurt) from a company called ‘Forger Project’. Unfortunately, it seems they only distribute in Utah; but I plan to enjoy their products as long as we are here! We stocked up and met a couple of interesting characters back in the eating area. We met Eric Bresselsmith of the House of Aromatics today at lunch and later this evening I attended his class on essential oils. Fascinating and educational. He makes a unique, really unique, series and blends of essential oils. Eric uses Conifer trees and wildcrafted plants. Totally unique, pure and organic. Another great ‘find’ today was a bottle of ‘Natural Pinon Cream’, Navajo Healing Ointment., made by Nellie Tsosie. Also, a tube of a moisturizer called Juniper Breeze also made by Nellie. When you are ‘out West’ you tend to get dry skin when you aren’t accustomed to the dry, DRY climate. After a few applications of the Pinon Cream, it amazingly helped some ‘bites’ and ankle abrasions as well as a blister on my Achilles tendon! AMAZING stuff and such a great find. I bought a couple large jars to take home. Nancy also found a lovely ‘Chef’ statue made by a Sedona artist that she purchased a ‘mate’ in Sedona. The Shoppe said that this statue was an ‘accident’ and came mixed with another shipment. The Vortex at work again! As I said before we had been to Moab back in 2015 when on another extended ‘Road Trip’. We had passed this unique place called ‘Hole N the Rock’ that is a 5000 square foot home that was drilled/blasted into the side of a massive ‘ROCK’. Today we visited and took the short tour. Pretty amazing that ONE Man and his Wife did this over a period of 20 years. Unfortunately, he died of a heart attack in his early 50’s and never completed his full scope and dream of a Home in a Rock. Amazing and well worth the modest entry/tour fee. We then dropped down a few miles to re-visit Wilson Arch (one of our trademark pictures). One of our favorite places to see and explore. It hadn’t changed as rocks usually don’t in a few short seconds that are years to us humans. This time we found a road that went ‘behind the rock’ and explored and took a few pictures. There are some homes there so most was private property. The front of the arch is public parking and openly accessible to all. We had our picture taken once again in similar positions and a few new good shots by a friendly visitor. See our web site in May for pictures. We headed back into Moab and stopped at the Moonflower Coop for lunch and ‘supplies’. I needed more Cashewgurt; man, this stuff is amazingly delicious!! The back-seating area was full so we took our stash the short walk back to our hotel and ate at tables there. Since it was early-mid day, it was a bit warm so I hit the pool and sun for an hour. The sun in Moab is HOT and I got a nice start at my summer tan! We wanted to explore the ‘Upheaval Dome’ in Canyonlands National Park as it is the ‘sister vortex’ to ones in Sedona. The sunset at Green River Overlook at Islands in the Sky in Canyonlands is supposed to be amazing so we decided to pack a ‘dinner’ and visit the park. I had to re-purchase a Senior Annual Pass for this trip. Luckily the wonderful folks at Wupatki had found and mailed my Lifetime Pass to our home in Orlando. We ate our ‘Kitchen & Love Quinoa Quick Meal of artichoke and roasted pepper. Amazing stuff, no refrigeration needed and great to pack and enjoy. We took some pictures and walked around the area of Green River Overlook. Amazing views and interesting rock formations. Sunset was at 8:03pm and the views constantly were changing as the sun set. Again, we took a multitude of photos and we will select the best and post on social media and on our site in May. The drive out of Canyonlands at night is not one to be taken lightly. It is DARK and you must drive through areas of ‘free range grazing’. The car ahead of us put on his flashers to warn us of several cows in the road, slow going as we wended our way to avoid them. Our ‘deer whistles’ had no effect on cows! It was late when we got back to our hotel so a shower and to bed it was. Tomorrow we will hike the Upheaval Dome and explore Dead Horse State Park. Up early and out again to visit Canyonlands. We had driven to Upheaval Dome and tried a short trail yesterday before going to Green River Overlook. We failed to really pay attention to the trail signpost and started up a ‘difficult’ path. It was rocky, poorly marked and as it turned out about an 8 mile trek. Since it was getting close to dusk, we turned around and went to our sunset viewing. Today, we did read the signs! 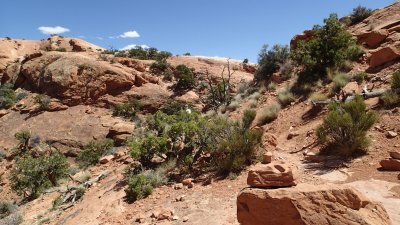 There is a great ‘moderate difficulty’ trail up to Upheaval Dome and two separate viewing points. It was about 2 miles up and same back; so 4 miles round trip. The day was marvelous and armed with our desert boots and walking sticks we started out up the trail. The trail was reasonable well marked, but there were spots where it was doubtful and we took a few wrong turns before we found the right path. All in a day’s hiking adventure. The climb was rocky and uphill all the way. In some places, ‘steps’ were carved or placed for the vertical climbs along the trail. Others were just rocky uphill treks. It took us about 45 minutes to get to the first overlook of Upheaval Dome. When we got close, the path disappeared and there was nothing but an almost vertical smooth rock climb to the top of the Dome. Thank goodness for my ‘Moab 2’ hiking boots, it made the smooth rock climb relatively and I thought I had glue on the bottoms as I scaled the smooth rock. Nancy was right behind me in her version of desert boots. Once at the top, the view was marvelous. I made three short videos of the climb and at 6500 feet, I am huffing a bit as I climbed. The wonder of the Upheaval was amazing. A picture/board explains that there were two opinions of how the Dome was created. One, a salt dome that collapsed, but how do you explain the UPLIFT and dome? Not so much. I agree with the theory of a meteor impact. Have you ever seen a slow-motion video of a water droplet hitting water? How it creates a depression then an uplift in the center? Well THAT is how Upheaval Dome appears to me. A big rock hit, liquefied the rock and formed a ‘water droplet’ effect that instantly cooled to form the Uplift Dome. That is my opinion and I’m sticking to it. Of course, aliens could have started the onslaught too <smile>. The area is full of similar but much smaller domed rock formations. Now the real challenge was to return Down the trail. Climbing up is difficult but going down steep inclines can also be a challenge. Again, these amazing desert boots we wore performed above and beyond. It truly was like being glued to the surface as we descended. But we did make it safely to our car and the stash of food in our car! I don’t know if it was the ‘vortex’ energy at the Upheaval Dome but even after that hike, climb and descent we weren’t really that tired so we decided to visit Deadhorse Utah State Park on the way out. Canyonlands and Deadhorse are adjacent and it was just a short drive to the State Park visitors center and viewing points. Just like the National Park Rangers, the State Rangers at Deadhorse were just as friendly and helpful. They cheerfully respond to every question and offer suggestions beyond. The views at Dead Horse UT State Park give a different perspective on Islands in the Sky. We met a crew of Chinese Americans from California on a 'caravan trip' (they all drove their own cars) at the visitor’s center. What a lovely and great group. One lady was showing friends her 'little' Passport Book and the sticker/stamp she just got at Deadhorse. I couldn't help myself as I had just stamped my 'BIG Passport Book' and showed her. She was in awe with all the stamps and parks we had visited over the past 7 years. Nancy broke out our walking sticks with all the medallions from just a few of the parks we have visited. WOW, they were impressed. I naturally segued into health when someone asked when and why we started doing this. One gentleman said he had had a bypass operation and had me touch his chest and the 'zipper scar' as he called it. He acknowledged that his diet/lifestyle had contributed and was determined to change. I think we made some friends! The views from Deadhorse Overlook are of the Colorado River. The Green River and Colorado intersect and I have to look up where and how they merge. Anyway, the view is similar, yet very different as the Colorado loops and flows through the canyons. There is one outcropping that looks just like a pyramid but made over the eons by flowing water. Amazing. Again, visit my web site in May for pictures. That was the end to a very long but exhilarating day. We slept in a bit after yesterday’s strenuous hiking. But still full of vim/vigor, we headed out to re-visit Arches National Park. Arches is much closer to Moab than is Canyonlands so it took just 15 minutes or so to get to the entrance. I stopped in to re-stamp my Passport book with a new visit date. When visiting Arches, you can just enjoy the drive but if you want to get up close and personal, you need to get out and hike a bit. Not like the hiking in Canyonlands, most trails are paved or easily navigated in Arches. We stopped by some favorite spots from our previous visit, including Balance Rock and others. Last time we didn’t venture up close to ‘Windows’ so wanted to do so this time. The walk, hardly a hike really, was a bit uphill but not bad at all. There are two arches, maybe a mile apart that look upon each other. Quite large aperture and rounder than Wilson Arch. Very impressive and the views are fantastic from either ‘window’. Back to the hotel after a relatively short visit. We had to get organized for our trip down to Santa Fe. Of course after a couple of weeks on the road, our duffel bags and suit cases were getting empty as the dirty laundry bag grew in girth. Since we had stayed at River Canyon Lodge before we knew a nice laundromat less than a block away through the hotel parking lot. Seems that they had updated and installed all new machines since our last visit. So the next 2 hours were spent doing our laundry. Once back to the hotel, we re-packed our bags for the trek to Santa Fe. I had planned to visit The Canyons of the Ancients along our way to Santa Fe but our Garmin GPS got us off on to dirt/gravel roads and we decided that it was too rough to pursue. As it turns out, we found out later, there is NO visitor center at the National Monument and it is hard to difficult to even find. So that was a bust and we ended up taking a roundabout way down to Santa Fe but the drive was nice through two different Native American Reservations. Boy is it dry and desolate but we did pass a Casino, if you can believe it! In the middle of nowhere there is the Ute Mountain Casino. We used it for a pit stop and wasted about $20 on ‘one armed bandits’ that no longer have arms! The Casino did have a ‘smoke free’ area but man, the stench of smoke in that place was overwhelming. Why are so many people committing suicide and wasting their money as they die a slow miserable death from smoking? We used the bathrooms and quickly departed! SO very sad how so many will suffer and die miserable, slow and agonizing deaths but we can’t force people to be healthy; only encourage them to try. We finally arrived at our Diamond Resort hotel, Villas de Santa Fe. We had booked a one bedroom suite with kitchen. Similar to our Diamond Resort room at Bell Rock Inn at Sedona, this room is much bigger with a separate bedroom and nice bath. We were greeted by gracious staff and since we asked our friends at Bell Rock to request a ground floor accommodation we were treated to a nice one, near the parking lot access. Lovely! Too late to prepare a meal in-house, we went to one of our favorite Indian Cuisine Restaurants, Annapurna’s® World Vegetarian Café, that have a mostly ‘vegan’ Plant Based Menu. I ordered a spicy stir fry dish with brown rice that was delicious if a bit hot/spicy. Nancy had a vegan burger with fries; unusual for her but that was what she was ‘in the mood’ for. That was the end of another long day! We love Santa Fe and every time we head west, we plan for a visit here. Our Santa Fe visit of 5 days will be mostly R&R from our more strenuous activities of the past weeks. Still a lot of walking and sightseeing we visited downtown that is now so familiar. We have been here often enough that we feel comfortable navigating and have our ‘favorite places’ to visit. Nancy always loves to visit The Loretto Chapel and the ‘miraculous staircase’. The staircase has an amazing history, so look it up and see our pictures to be posted in May or on our FB pages. Nancy had bought a ‘Miraculous Medal’ of the Blessed Virgin at the Sedona Chapel of the Holy Cross. She found a sterling silver artistic cross with a turquoise stone in Sedona that complimented her medal. So here at the Loretto Chapel, she found a turquoise bracelet with Our Lady of Guadalupe medal. She is getting attached to Our Lady, sterling silver and turquoise it seems. So we walked and shopped. I love the various New Mexico desert soap concoctions and the scents and lotions. One of my favorites is from the Santa Fe Soap Ranch. Not all are free of some chemicals but for the most part nice soaps. I love their Cedarwood Patchouli shaving soap round bar; I’m usually a brush/soap/foam shaving guy when at home. I discovered a new brand from the Sandia Soap Company of Albuquerque. They have a frankincense bar and a Pinon bar made with pinon sap; a healing balm that should complement the Pinon Cream I bought in Moab made by Nellie Tsosie. Boy that cream WORKS! So back to the hotel and some web updates and postings. Lots to catch up on so good night! While there, we lit two candles to promote our own healing and happiness. Nancy had purchased a Cross in Moab and a ‘Miraculous Medal’ from the Sedona Chapel of the Holy Cross. She found the pastor of the Santuario in his office and asked for him to bless them and he graciously doused them and Nancy in Holy Water and gave them (and her) his blessing. Nancy was thrilled! After completing this visit (our second) and filling bottles with ‘sacred sand’ and some holy water from the fount in the church, Nancy found a small hollow heart-shaped charm that she had filled with ‘sacred sand’ and added to her chain. Looks nice. All that done, we said our goodbyes to Chimayo and headed to Bandelier National Monument near Los Alamos where the first Atom Bomb was developed by Robert Oppenheimer (I am become death, the destroyer of worlds.). We bypassed visiting Los Alamos preferring to proceed to Bandelier for some hiking/climbing. The ancient ruins are amazing and it is astounding how these people lived in this primitive environment. The Ancestral Pueblo people lived in Bandelier from approximately 1150 CE to 1550 CE. They built homes carved from the volcanic tuff and planted crops in mesatop fields. Corn, beans, and squash were central to their diet, supplemented by native plants and meat from deer, rabbit, and squirrel. Domesticated turkeys were used for both their feathers and meat while dogs assisted in hunting and provided companionship. It is a lovely hike (mostly paved or well tread gravel pathways). There are some steep climbs and you can climb wooden ladders and enter the very small dwelling places. We had lovely weather and enjoyed our hike through the ruins. After a nice picnic lunch, we headed back to our hotel in Santa Fe; a full day! For pictures and more information, visit our travel site: http://roadtrip.skipstein.com in May 2018. We got a good start but really did sleep in just a bit. We headed downtown to walk the ‘Art District’ along Canyon Road. We first stopped by our favorite ‘chocolate shop’, Kakawa Chocolate House. They make/sell historic drinking chocolate elixirs include traditional Pre-Columbian, Mesoamerican, Mayan and Aztec drinking chocolate elixirs; 1600's European drinking chocolate elixirs, Colonial American and Colonial Mexican drinking chocolate elixirs. Kakawa Chocolate House drinking chocolate elixirs are representative of these historic recipes and span the time period 1000 BC to the mid-1900s AD. Delicious and we always take ‘one to go’ and a couple of mixes to take home! After a nice long walk, we headed back to our hotel and I had laundry to do! Luckily, next to the laundry (free) there is a nice pool table where I could practice my long lost and stale skills on the table. I went through several racks and found that I still retained a bit of my past skill; but not enough to brag about. Laundry done and folded, I headed back to our room where Nancy had been ‘organizing’ and repacking for our trip to, what we had planned to be Hot Springs Arkansas. While I was shooting pool, Nancy did some research to find the best place to experience the waters of Hot Springs. Low and behold, she found more than what we had bargained for. CRIME is rampant, even in the National Parks. Hot Springs seems to have WAY higher crime rates than Arkansas itself, which isn’t all that great anyway. So, we reassessed our plans and decided to head to Branson Missouri for a couple of days instead. We had visited Branson and enjoyed it a few years back. I checked and voila, there is a Diamond Resort there too! Bingo, I checked and booked us for a two-night stay at a really great rate! I also had to adjust arrangements after Branson, so canceled our other plans and booked us into a Candlewood Suites in Birmingham Alabama. Going to be another long drive there and then to Orlando but we are anxious to get back home.